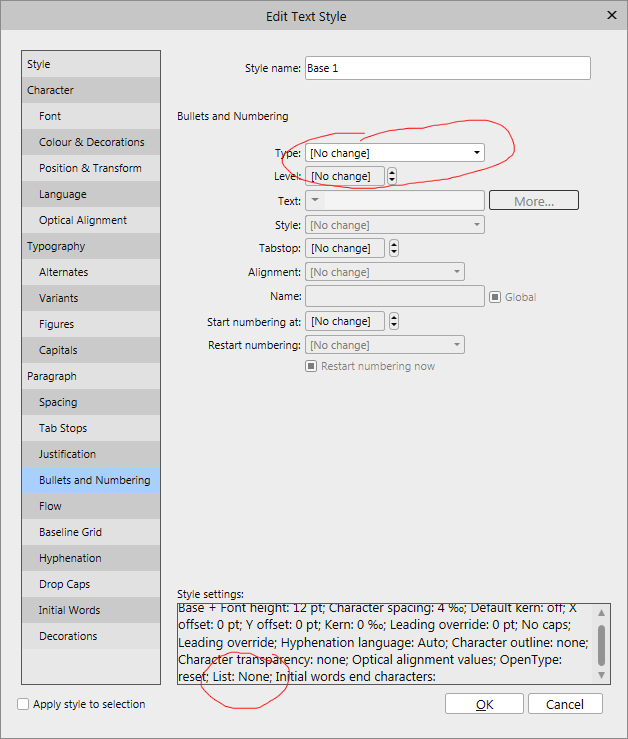 In the Text Styles panel, the functions Duplicate "..." and Create Style based on "..." do nearly the same. While duplication does what I myself expect it should do, basing a new style on an existing one does not: When creating a new style based on, e.g., the style Base, I would expect the newly created style to be defined as Base + [nothing] by default, meaning it is the same as Base and does not change anything. Unfortunately, this is not the case. Instead, the newly created style is automatically set to Base + [hundreds of settings that are copies from Base]. This means that when changing Base at a later time, nothing is delegated to the dependent style, because all settings of the dependent style were overwritten with copies at creation. After creating a style based on some other style, this now makes it necessary to manually set hundreds of settings to [no change], which is extremely tedious. This might be by design and not a bug, but I myself find it extremely impractical and like the way PagePlus (and all other programs) works much better. - Font: The font size can apparently not be set to [no change], it always contains a valid size in points. - Decorations: These can only be enabled or not - a don't change setting of the check box and all other settings is apparently not possible. Even some settings that can properly be set to [no change] in the dialog show up in the textual style settings as if they were well-defined: In the attached screenshot, the descriptions shows hyphenation language: Auto (even though it was set to [no change]), List: None (even though it was set to [no change]), etc. When creating a new style based on, e.g., the style Base, I would expect the newly created style to be defined as Base + [nothing] by default, meaning it is the same as Base and does not change anything. Unfortunately, this is not the case. Instead, the newly created style is automatically set to Base + [hundreds of settings that are copies from Base]. I don't see that, on Windows 10. My new style (as shown while defining it, or found later by scrolling down the style list in the Text Styles panel) is defined as Base + [no changes]. I create a new file with some defaults and directly try to create new styles from the existing ones. If I base the new style on an existing group style, I get the already mentioned copy of hundreds of different settings (video 0:00-0:26), which afterwards can not be set to [no change] anymore due to other bugs. If I base the new style an an existing paragraph style, the situation gets much better (video 0:31-0:41), but still not 100%: Here, only the 12pt font size is added (but can also not be changed afterwards). If I base the new style on a different existing paragraph style, the situation might be totally different (video 0:48-end). By some mysterious reason, several other settings are added (some of which can not be changed later). Some of the mentioned problems still remain. Fortunately, they are now easier to spot, because the style settings text in the Create Paragraph Style dialog is now not so cluttered anymore. Before the attached video starts, I just created a new document, right-clicked on the base group style and selected Create Style Based on. When the dialog opens up, everything seems to be correct at first glance. Selecting Position & Transform, though, still shows zeroes for kerning, tracking, baseline and leading (as mentioned before), even though these should be set to [no change]. Manually selecting [no change] in the drop-downs now show up as zeroes in the style settings text at the bottom of the dialog. Apparently, there is come mix-up of the settings 0 and [no change].